Payentry is the full-service solution that assists with everything HR. As a human resources outsourcing company, we handle it all: job postings, interviews, onboarding, tax credit identification, payroll management, compliance, reporting, and more. No matter your HR needs, we are the human resources support and human resources service company that gets the job done. With Payentry, you have everything you need for HR wrapped up in one easy-to-use and comprehensive system. We will make your life easier, your company compliant, and ultimately, your business more profitable. Human resources standards and regulations are updated too frequently for businesses to keep up. Do you get frustrated trying to keep tabs on how changes in the law affect your business? Do you need support dealing with the unavoidable issues that arise with employees? 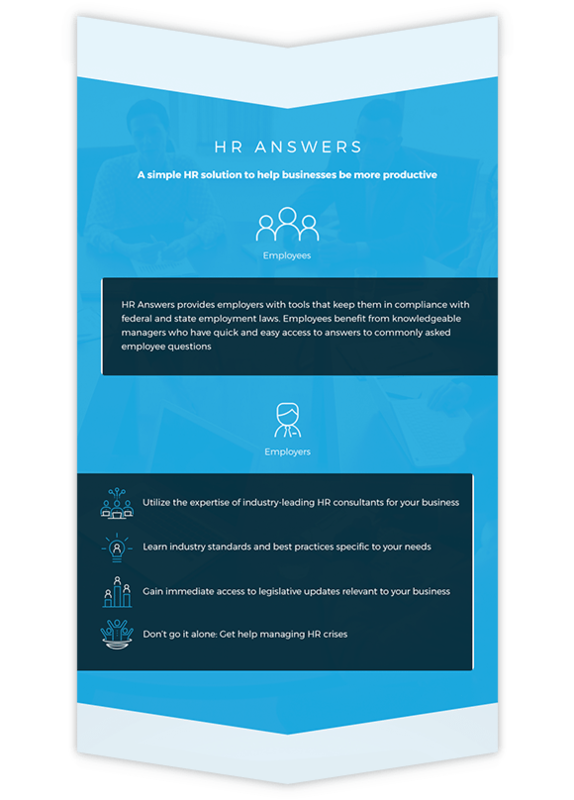 HR Answers is one of the most powerful components of the Payentry solution. It provides you with the valuable HR insight that comes when you hire an outstanding human resources outsourcing company. Once you have HR Answers, you’ll wonder how you ever got by without it. Who are the HR Pros? What’s in the HR Support Center? Keeping your business 100% compliant with all local, state, and federal guidelines can be overwhelming. Small mistakes can add up and having access to a comprehensive solution that keeps you in check is a big help in avoiding costly errors. The Affordable Care Act can seem daunting and difficult to deploy. Payentry has developed a powerful set of solutions to help you tackle your responsibilities as an employer. We make it easy to determine the options that work best for you and we provide a simple way for you to notify your employees of their changing rights and benefits. No one is quite sure when the FLSA overtime change will go into effect. But to be proactive, Payentry has developed an entire set of tools to help your transition go as smoothly as possible. Because employee handbooks are a legal tool, they require a lot of legal knowledge to be effective. Instead of trying to get it right on your own, Payentry lets you fill out some simple details and generate a comprehensive document in a matter of minutes. Payentry’s pre-written employee handbooks introduce new employees to your company values and act as an effective onboarding tool. They help you clearly explain an employee’s job duties and expected conduct, as well as the rights of the employee. Other subjects may include dress code, compensation policies, the amount of sick time or paid time off available for employees, and additional employee benefits. State and federal law requires employers to post labor law notices in the workplace. These mandatory postings include OSHA, Federal Minimum Wage, FMLA, USERRA and various state-specific notices, and any failure to post them can result in hefty fines and lawsuits. To complicate things even further, labor law requirements can change at any time of the year. With these changes come new notices that need to be posted quickly in your workplace. With Payentry’s human resources management service, we provide automatic labor law poster updates that keep you ahead of impending changes and in compliance with state and federal laws. These poster updates are just on more way Payentry’s human resources support ensures you excel in all things HR. Administering benefits within a payroll system has always been a headache. Before Payentry, most companies were forced to resort to several different vendors to get the job done; in the process, these companies often ended up paying 5% too much towards their benefits costs. With Payentry’s Benefits solution, you have access to a human resources management service that dynamically updates employee benefits with payroll, keeping your HR costs at a minimum. From benefits enrollment and insurance carrier connections to group plans and COBRA administration, you can count on Payentry’s Benefits Solution; in fact, it’s the perfect tool for all your human resources support needs. By streamlining the traditionally time-intensive tasks associated with employee benefit enrollment and administration, Benefits Solution keeps your HR benefits team on track and on schedule. Are you traveling out of the country and want to change your benefit plan? No problem! You can easily access Payentry on your iPad or mobile device, simplifying your compliance with COBRA and the Affordable Care Act at home and abroad. With Payentry, we make life easier; all your forms are digitized and stored in a safe, convenient, and accessible location online. Hiring is a good thing! It means you are growing. However, managing the process of hiring can be a real headache. There are mountains of paperwork and ever-changing regulations, and every little mistake increases costs and inflates your timeline. With our advanced employee onboarding system, you will avoid the common errors that plague HR. Payentry’s Hiring and Onboarding tools cover all your new hire needs. When it comes to Payentry, background checks, E-Verify, and Work Opportunity Tax Credit screening are just the start. No matter your needs, Payentry’s superior human resources support will take care of the little details, leaving you to focus on finding the right talent for your business. The Work Opportunity Tax Credit (WOTC) is a federal tax program that gives employers up to $9,600 per employee if the employee meets certain criteria (including, quite simply, where they live). At Payentry, we recognize the value of every hard-earned dollar, which is why employee screening for WOTC is included in our human resources management service. When someone applies for a job, Payentry asks a few questions to see whether or not they qualify for WOTC. If so, you’ll see the amount they qualify for next to their application. Once an applicant is hired, Payentry will start the WOTC Certificate process, all with an eye for employer transparency and ease. While it’s exciting to have new hires, filing I-9 forms has always been a laborious process full of piles of paperwork. Fortunately, now there’s E-Verify. E-Verify makes life simpler. With Payentry’s services, all your E-Verify and your I-9 forms are seamlessly incorporated into one onboarding process, resulting in a hiring timeline that works with your needs and expectations. There is no “one-size-fits-all” background check. Different positions demand different levels of inquiry, and sometimes it can be hard to keep track of it all. With Payentry’s human resources service, you can create customizable reports that give you access to the exact level and type of inquiry required for each position. Once you’ve received your report, it’s a cinch to verify a candidate’s history and move on to hiring and onboarding with all your important documents in one convenient location.